If comparing car insurance rates from different companies seems like a foreign concept to you, you could be missing out on some serious savings. How much? It depends on where you live and who your insurer is, but according to a NerdWallet study, an average driver could save $859 per year — more than $70 a month — by shopping around for the best rates. Americans could save an average of $859 a year by shopping around for car insurance. 70% of consumers have been with the same auto insurance company for four or more years. During that time, they could potentially have saved an average of $3,436 by switching to a lower-priced insurer. 38% of car insurance customers have never compared auto insurance quotes, and only 16% compare rates yearly. We looked at car insurance quotes in 1,000 ZIP codes across the United States. While potential savings vary by state, we found an average possible savings of 47%, or $859 a year. Savings in various states ranged from a few hundred to several thousand dollars per year, so no matter where you live, there’s value in comparing insurance rates. Here’s a look at the potential savings nationwide and for the five largest states. For the breakdown of all 50 states, click here. Additionally, in most states, the difference between the lowest and highest quotes is well over $1,000 a year. And while not everyone will qualify for, or even want, the cheapest possible insurance rates, you likely have the opportunity to save money. According to our survey, 70% of consumers haven’t switched auto insurance companies in at least four years. Assuming a potential annual savings of $859, these consumers could be spending an extra $3,436 during that span. 42% believe the average person will save less than $100 a year, as opposed to the $859 found by our study. 6% think annual savings of more than $400 is possible. 38% say they never compare car insurance quotes. 15% of car insurance buyers got quotes from more than four companies the last time they shopped around. 27% got only one quote before buying. 25% think it’s too much of a hassle. 31% think it’s too time-consuming. Comparison shop for the best rates. It’s worth your time to compare rates from several insurers. The company that offered a good deal years ago may no longer be the cheapest for your situation. NerdWallet’s car insurance comparison tool can help you easily find prices. Adjust your coverage as your driving habits change. If you move closer to work or start working remotely, ask your agent if you qualify for a lower rate. Driving less can lower your insurance costs; don’t pay for miles you aren’t traveling. Consider dropping collision and comprehensive coverage on older cars. This kind of coverage pays for damage to your own car, or theft. But if your car is older or not worth much, the potential insurance payout, after subtracting the deductible, can be minimal or nonexistent. Bundle your insurance policies. If you buy multiple kinds of coverage — such as auto insurance and renters or homeowners insurance — you can likely save money by buying them from the same insurance provider and getting a bundling discount. Keep your credit in check. In most states, insurance companies can use your credit history to help determine your rates. For this reason and more, it’s a good idea to check your credit reports once a year to make sure the information is accurate. If your credit score is lacking, check out our building and rebuilding credit guide to learn how to improve your credit health. Always ask about car insurance discounts. It’s good to ask your agent to review available discounts to make sure you’re getting everything available to you. For example, maybe your teen driver qualifies for a good-student discount. NerdWallet analyzed insurance rates across the country for a variety of drivers, vehicles and coverage amounts. 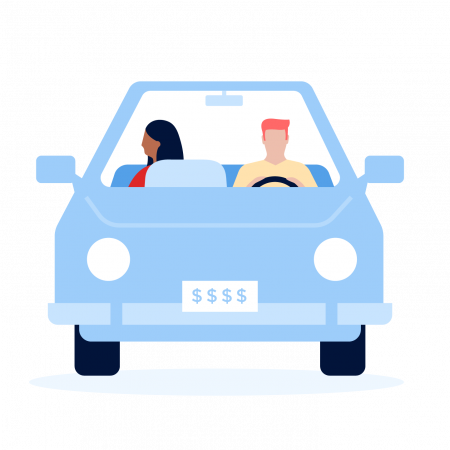 We averaged car insurance quotes for eight driver profiles: 27-year-old single men and women and 40-year-old married men and women each driving a Toyota Camry and Ford Escape. We collected a random sample of 1,000 ZIP codes, proportionally distributed across each state by population. The 27-year-old drivers were quoted 30/60/25 liability and uninsured motorist coverage required by the state. The 40-year-old drivers were quoted 100/300/100 liability coverage limits and the same amount of uninsured motorist coverage. All profiles have a comprehensive and collision deductible of $500. All profiles in Florida, Hawaii, Kansas, Kentucky, Massachusetts, Michigan, Minnesota, New Jersey, New York, North Dakota, Pennsylvania and Utah include required personal injury protection ranging from $3,000 to $1 million, depending on state requirements. Rates can be found in NerdWallet’s car insurance comparison tool. We found the weighted average premium by multiplying each company’s rates by its market share percentage in that state, according to A.M. Best. We considered only the nine least expensive rates in each ZIP code for a conservative estimate for the average rate in each state. We then compared our weighted average against the lowest premium we found. We used SurveyMonkey to survey 1,068 people 18 or older who own a vehicle and have purchased auto insurance. Jeffrey Chu is an analyst covering insurance for NerdWallet.